This is a story about Meher Mount's then neighbor and well-known actor, Larry Hagman, and caretaker Agnes Baron. It was told to Elizabeth Arnold by John Bryson, a frequent visitor to Meher Mount in the late 1980s/early 1990s. John had just finished building a fence for Agnes near the main entrance to Meher Mount. He then saw a man accidentally drive into the fence knocking it down. John completely lost his temper and ran as fast as he could to catch the man in the car. He yelled and screamed at the man. The man apologized, and said he would fix the fence. When John Bryson saw Agnes later that day there was a bouquet of flowers and a bottle of wine on her table. But, John could see that Agnes was happy to receive the flowers and wine from Larry Hagman anyway. It is interesting that many years later in 2003, Larry and Maj Hagman donated metal, swinging gates they no longer used to Meher Mount. Ray Johnston and Elizabeth took them to an iron worker who modified the gates by cutting them down. 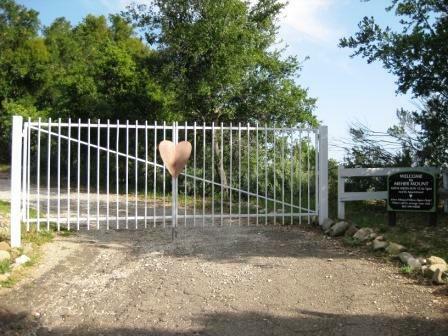 Ray designed the gate to include a metal heart to be welded onto it. With assistance from Elizabeth, Ray did most of the work and completed both the wooden fence and the metal gate which was attached to new metal posts. 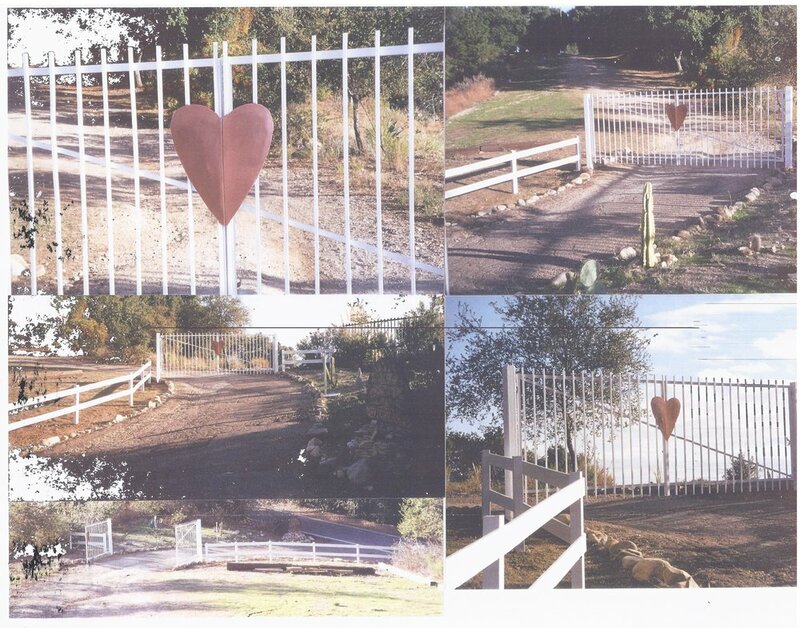 They painted the fence and the gate white, and the heart was covered with reflective copper paint.